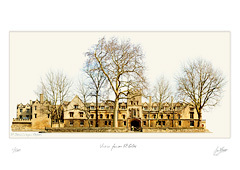 St John’s College was founded in 1555 by Sir Thomas White when he bought the premises of the former St Bernard’s College and the ground to the east of it. 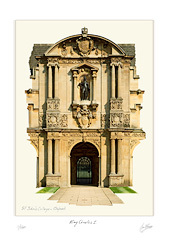 It was the first Oxford college to be founded by a merchant rather than a churchman. 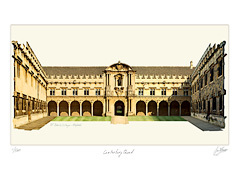 The New buildings are on the western side of the North Quad flanking St Giles. George Gilbert Scott Jr. was chosen in 1879 to be the architect but he only built one Tudor-Gothic style block which includes twenty sets of rooms, a lecture room and the gate tower. The statue above the gateway is of St. John the Baptist. The remainder of the buildings were built under the supervision of EP Warren whose brother was President of Magdalen College.